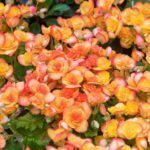 Need to classify large hairy leafed and stem shrub begonia for flower show. Underside of leaf is maroon with green veins, top side of leaf is medium dark green with light green veins, and flowers are pink and green for they are just starting to bloom. Could it be begonia soli-mutata? AKA Sun Tan Begonia?